After series of successful collaborations with different brands and types of products, Shepard Fairey (featured) just revealed his latest joint effort with luxury Swiss watchmaker Hublot as the latest addition to their “Hublot Loves Art” series. 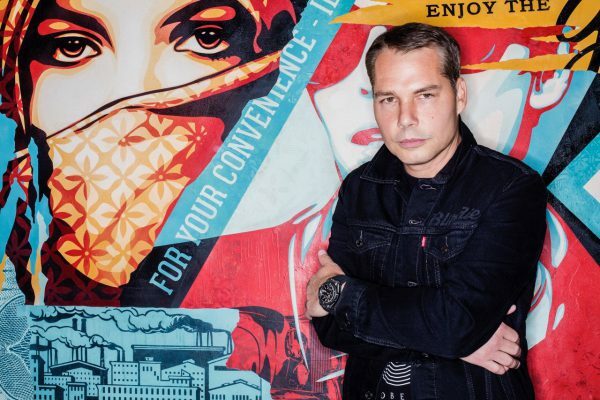 The American contemporary street artist, graphic designer, activist, and illustrator, was announced as an official brand ambassador during the unveiling of an exclusive new timepiece titled the Big Bang Meca-10 Shepard Fairey on May 16th in the East LA neighborhood of Silver Lake. Co-designed with the artist, this model is part of the Big Bang Meca-10 family, a newer innovation on Hublot’s signature style with the brand’s in-house movement, a gear-driven mechanical aesthetic, and a 10-day power reserve. Developed over a span of two years, an opening at 3 o’clock reveals Shepard Fairey’s “STAR GEAR” logo while the Texalium™ case features a tribal, floral pattern to mimic the artist’s work, which extends throughout the straps. 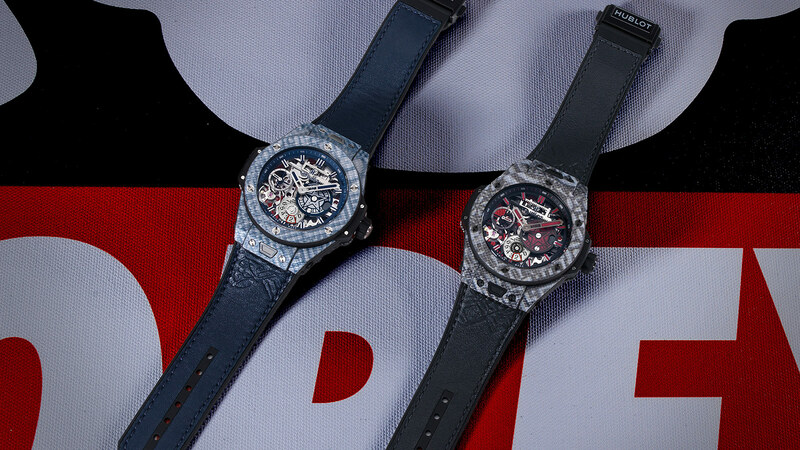 Available in a limited edition of 100 pieces of black and navy blue colorways, each piece ($28,300) comes in a special case containing a signed and numbered letterpress print “Star Gear Collage Red” or “Star Gear Collage Blue,” framed in concrete, as an extension of the design and color of the corresponding watch. We had a chance to talk with Shepard about this unique partnership, discuss the difference between designing large murals and tiny watch parts and the way these kind of ventures affect his everyday creative practice. Arrested Motion (AM): How much of a challenge was it working on something of such tiny scale, especially when compared to the large size murals you’ve been creating in the last several years? 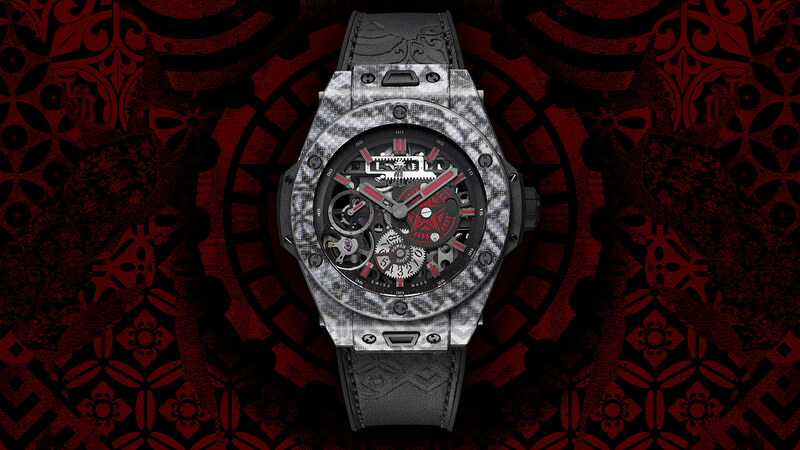 Shepard Fairey (SF): My creative process for working with Hublot, was to look at the size of the ‘canvas’ and think ‘what are the natural elements within my work that would work harmoniously with the overall watch’. There isn’t a lot of surface area and the design shouldn’t be too flashy. I looked at the subtle elements of my work; a lot of the foundation work that I do in my collage(s) have a subtle, tonal quality I thought would be elegant and could work well. The amazing thing [about] working with Hublot is that they say, ‘we can try anything that you want’; they were very open to anything that I wanted to experiment with and they take a lot of pride in pushing the envelope in terms of technique. This is a luxury timepiece so there’s no limitation to the length that they will go to execute something in a beautiful and sophisticated way. AM: Did you have any influence on the construction/architecture of the watch elements? SF: The aspect of the watch I’m most excited about is the Texalium [which] is a really amazing substance to work with. It has a translucency but it’s also very hard so you’re actually seeing the imagery itself through a translucent case. It’s printed essentially on a silk, it feels perfectly integrated into the watch, but it changes with the light. That’s very unusual and spectacular and something that I hadn’t seen before. AM: Did you create any new imagery for the watch or were all of them from your existing “clipboard”? SF: I looked at the elements I use in my work that I think work well graphically and that can be read in a small area but also have a signature look that is recognizably mine. AM: How does it feel to work on such luxury item projects almost simultaneously with We The People or similar ones? 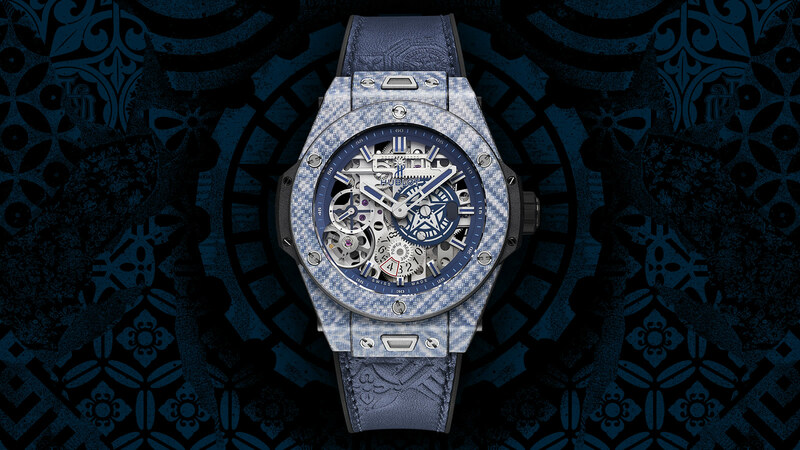 SF: Hublot is about craftsmanship and a very refined execution and that to me as what my art is about: doing whatever it takes to create a visual that I think is important to create. So, there’s that craft that goes into it on both sides that makes it the perfect marriage. AM: Speaking of the engaged, activism part of your practice, is there something special in the pipeline that you can share? The times we live in must be constant inspiration to create work that will empower and inspire. SF: I draw inspiration from everything out there that’s powerful. I’m a student of art history, design history. I walk around cities and take photographs. I look at hand painted signage, murals, architecture, patterns in ironwork, in tiles, all these things inform what I make. But it’s all filtered through my sensibility in a way that I think is recognizably my own. I’m standing on the shoulders of all the great work that has come before me, but I think with my own voice. Categories: Art products, Features, Interviews, Releases, Street & Urban Art. Tags: Art products, Fashion, featured, Features, Interviews, Releases, Shepard Fairey, slider-featured, Street & Urban Art.